Microsoft quietly narrowed the scope of Xbox Play Anywhere by altering an announcement from June. "When we unveiled Xbox Play Anywhere, we said that every new Microsoft Studios title shown at the Xbox E3 2016 Briefing will support Xbox Play Anywhere. We understand that a recent blog post didn't specify that the only Microsoft Studios titles we've confirmed to date as Xbox Play Anywhere were shown at the E3 2016 Xbox briefing. We've updated the blog post and apologize for any confusion. You can go to www.xboxplayanywhere.com to see the current list of participating games." It sounds like the blog post that raised the issue may have been in error, and the update was simply to bring things in line with plans for the program. ORIGINAL STORY: When Xbox Play Anywhere was announced during E3, it sounded like a boon for both PC gamers and Xbox One gamers. Under the program, games available on Xbox One would also be available on Windows 10. That was reinforced by a post on the Windows Blog (see it on the Internet Archive's Wayback Machine) on June 29, which said, "Every new title published from Microsoft Studios will support Xbox Play Anywhere and will be easily accessible in the Windows Store." This led to a number of stories that speculated there would never be another Xbox One exclusive. Unfortunately, that may not come to pass. 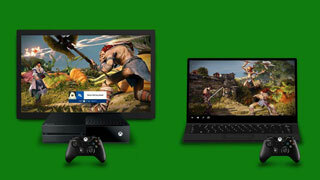 Microsoft has quietly edited the aforementioned post to read (emphasis mine), "Every new title published from Microsoft Studios that we showed onstage at E3 this year will support Xbox Play Anywhere and will be easily accessible in the Windows Store." You can see the edited post here. The edit was spotted by YouTuber The Red Dragon in this video. While it's not super surprising to see Microsoft roll this back a bit, it is disappointing. Play Anywhere was looking to be a huge boon for PC gamers, but it may be less so with this change. Additionally, even this edit doesn't explain Dead Rising 4, which was announced at E3, but doesn't appear on the list of Play Anywhere titles. We've reached out to Microsoft for a comment on this change, and we will update this story with any response we receive.